For some reason I’ve remembered my dreams recently, though I usually forget them by morning. This is a short one from last night. For some reason I was confined in a cold jail cell, and the cell’s heater was simply a series of heated squiggly tubes, like a television antenna, resting on a stand. The heater didn’t work well, and when I asked the jailer why it wasn’t working, he provided me with—and explained—a diagram of how a duck’s legs remain warm in cold water through the anatomical and physical process of countercurrent distribution. That’s all, except the diagram and the amazing way a duck keeps its legs warm has absolutely nothing to do with the poor heat radiation of a thin, heated tube in a cell. But of course it was just a dream. But here’s a chance to learn how ducks keep their naked legs and feet from freezing in chilly water. The explanation of countercurrent distribution comes from here. Ducks, as well as many other birds, have a counter-current heat exchange system between the arteries and veins in their legs. Warm arterial blood flowing to the feet passes close to cold venous blood returning from the feet. The arterial blood warms up the venous blood, dropping in temperature as it does so. This means that the blood that flows through the feet is relatively cool. This keeps the feet supplied with just enough blood to provide tissues with food and oxygen, and just warm enough to avoid frostbite. But by limiting the temperature difference between the feet and the ice, heat loss is greatly reduced. 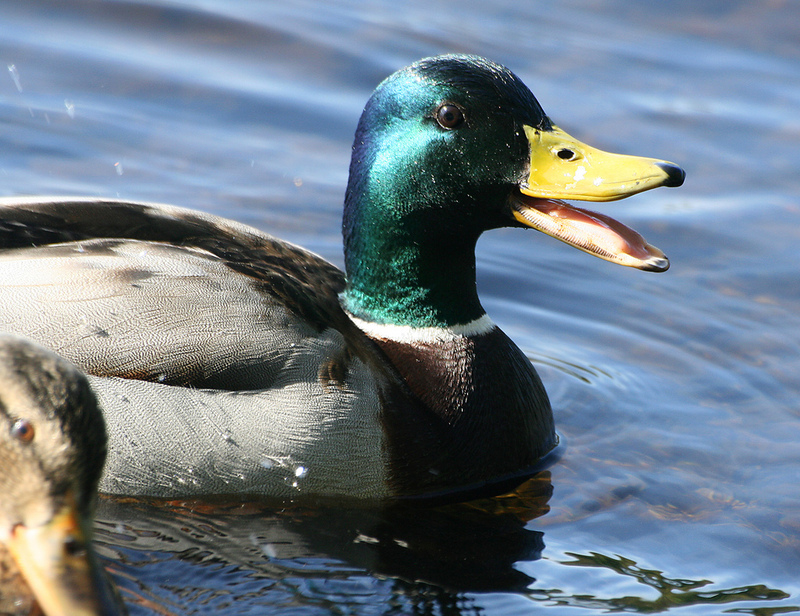 Scientists who measured it calculated that Mallards lost only about 5% of their body heat through their feet at 0o C (32o F). To put this in perspective, the rest of the duck is covered with feathers and in contact only with air, not ice, but because the body is relatively hot, 95% of the heat loss is from the head and body. Meanwhile, the cool feet sit on ice and give up very little heat. 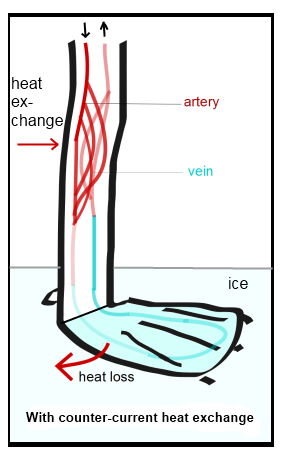 More Info: In the diagram [below], without counter-current heat exchange, warm blood makes it all the way to the foot. This keeps the feet considerably warmer than the ice the duck is standing on. Remember that heat flow is roughly proportional to the temperature difference. 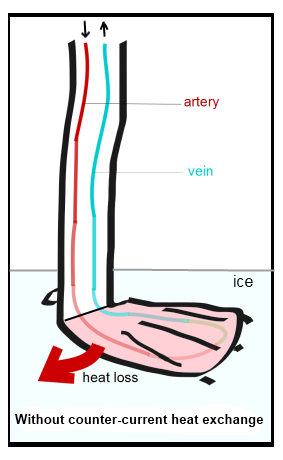 With a large temperature difference, there is a large flow of heat from the foot to the ice. In the second diagram [below], you’ll see that multiple branches of the artery are in close contact with branches of the vein. This intertwining of arteries and veins is called retia (singular – rete tibiotarsale). Because heat flows from the arterial blood to the venous blood, the arterial blood becomes colder and the venous blood becomes warmer. Less warm blood gets to the foot, keeping the foot cold and reducing the temperature difference between the foot and the ice. This reduces the flow of heat from the duck to the ice. This entry was written by whyevolutionistrue and posted on November 30, 2018 at 7:30 am and filed under dreams, ducks. Bookmark the permalink. Follow any comments here with the RSS feed for this post. Both comments and trackbacks are currently closed. I wonder if the heat exchange in the duck’s legs is where they got the idea for the air exchanger they put in some houses. They kind of do the same thing. Even the geo-thermo heating system works in a similar way. I always reference counter-current heat exchange if animal limbs in cold environments when I discuss how this phenomenon is used in the spermatic cord, with exchange between the testicular artery and pampiniform plexus, to provide blood to the testis that is cooler than body temperature. bird’s legs and dolphin’s fins, but not just for heat. IIRC fishes’ gills do the same for O2: the water-flow is counter the blood-flow in the capillaries, ensuring gas exchange over the full length of the flow. Low oxygen blood exposed to low oxygen water -but still higher than in the blood- and high oxygen blood is exposed to the freshest water. And I’m not sure, but I’d bet a bottle of wine the same goes for bird’s lungs with their through-flow. Have to add mammalian kidneys, which use a counter-current of osmolality to concentrate urine, allowing them to preserve water. They do an amazing job in desert animals. Humans can achieve ~ 4x urine/plasma osmolality. Kangaroo Rats can reach 18x, or so say the texts. Yes, I guess it is a kind of universal in life. There’s a TED talk by Ray Cronise who argues that Olympic swimmers maintain such good BMI’s while consuming high calorie diets because the water temperature is held below body temperature. Poor PCC is missing his ducks. Man-oh-man, could those Everlys harmonize. My favorite tune of the 70s. Actually this song came out in 1958. I used to sing it at the top of my lungs, while on the back-yard swing, as a 9-year-old. Yes, you’re right. What was I thinking. I think it was the first single(45rpm) I ever bought. 1958. I was 12 years old. So long ago. Based on the comments so far, I take it that this same process applies to, among other animals, d*gs traipsing through the snow. Is that correct? Are duck feet very low in nerve cells? So they don’t feel the harsh cold? And if so, how do they feel the water when they paddle? Feeling the water must be important to steer. Cold receptors, pressure receptkrs and proprioception receptors are different receptors. I fail to see a serious problem there. Maybe your brain was looking for a connection between the “series of heated squiggly tubes” and a rete mirabile (Latin for “wonderful net”). Apparently ducks and other water fowl also restrict blood flow to their feet in cold weather. So the feet are colder than the rest of the body, resulting in less heat loss through them. How about cat’s ears? I know they have a large blood vessel around the edge to keep the tips from freezing, but are they set up to minimize heat loss in the cold or maximize heat loss in the summer heat (esp. in their ancestral home of north Africa)? Well, there is a kind of biological ‘law’ there: the hotter the climate, the larger the ears. I think in many mammals ears are used to lose heat. Don’t ask me how that would work if the outside temperature is higher than the body temperature. Any experts here? See the Wikipedia articles on Allen’s rule and Bergmann’s rule for some relevant information. When heat loss is favored by selection, I’d expect no heat-conserving countercurrent exchange mechanism to be present. Cat’s ears do freeze. Look at Gus. Say, where IS Gus these days? I miss him! Recently, with the temperature around -5C and a layer of frost everywhere, a robin sitting on a branch for at least 30 minutes, tried to fly, but it’s feet were stuck and it thrashed about for a few seconds before tearing itself free. Oh my gosh. I wouldn’t have guessed that could happen. I hope it was okay. Yes, I’m sure it was OK. It probably flew off to some other tree with berries where it moved about feeding with little danger of getting stuck again. We have dozens of robins here on the Snake River who seem to be willing to stick with us through winter. The river keeps air temperatures moderated along the banks where robins abide. Having idly wondered, perhaps because winter chilblains are a regular affliction, why water birds’ feet and legs don’t freeze, I found that post particularly interesting. Nature is endlessly fascinating. I very much like to learn new things, thanks for this one.